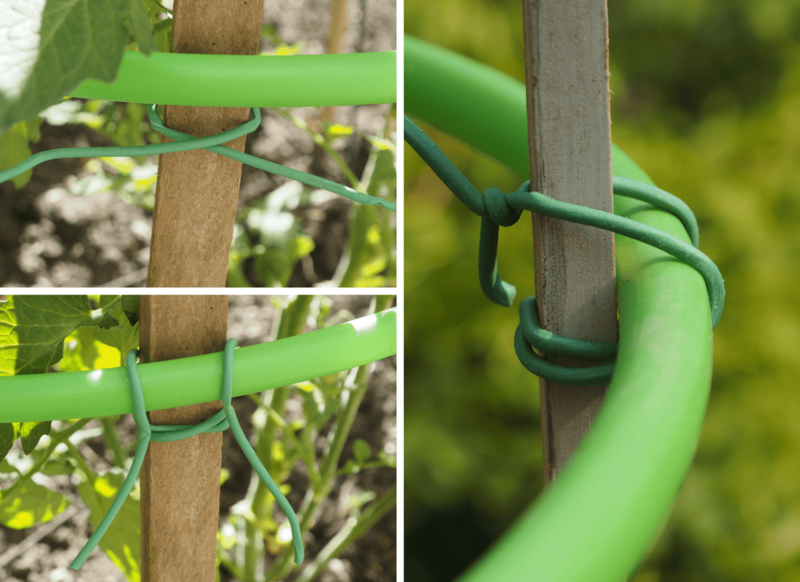 I saw this idea for a folding tomato cage when looking online one day. It looked like a perfect solution for containing tomatoes but the price tag was a little more than I wanted to spend. Made out of stainless steel it was a series of rings attached to a rod which you put into the ground. At the end of the year you just pulled up the rod, the rings fell down and you stored it. It got me to thinking about how I could make my own DIY version of this and I came up with the following idea. First, I assembled all the items that I would need. This was a bit of trial and error at first, as originally I was making this for a bean trellis for the scarlet runner beans and I’ll explain more about that later. Put the hoola hoop on the ground or around the plant that you are wanting to cage. Put the bamboo sticks on the inside but on opposing sides of the hoola hoop like in the picture below. Make sure the rod are tight against the sides and push them into the soil. Lift up on the hoop to where you would like the first support to be leaving the sticks in the ground. This may differ in height depending on the plant you are supporting. 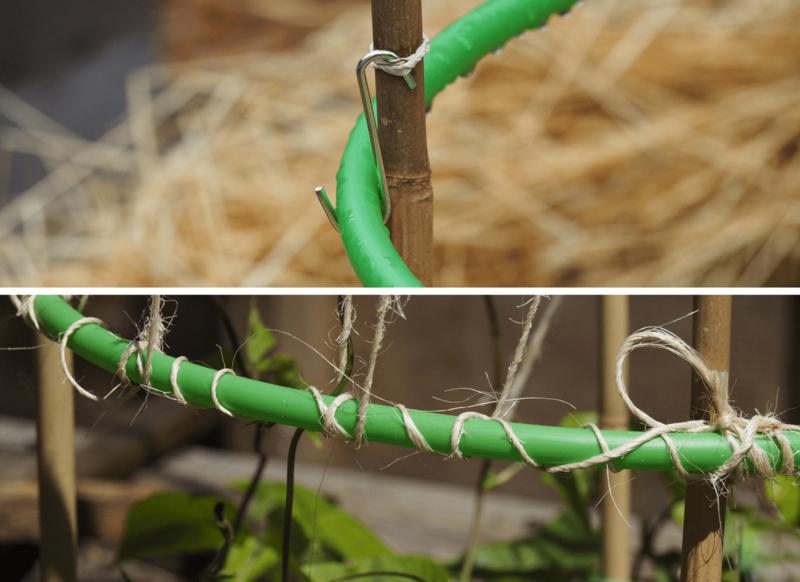 Using either the coated plastic wire or twine, secure the hoop to each of the four bamboo sticks. I found that I used approximately 12 inches of wire per tie and once I had that measurement, I just went ahead and cut 4 pieces of it to attach a hoop. 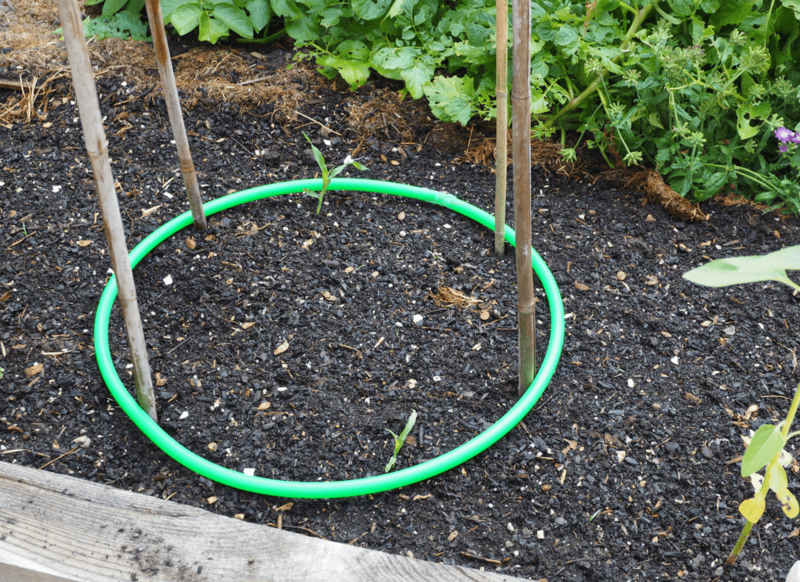 Then put another hoop over the bamboo sticks and secure that in place at a distance from the first hoop that will contain the plants but still allow you to access them. Continue with the hoops until you have the desired amount. 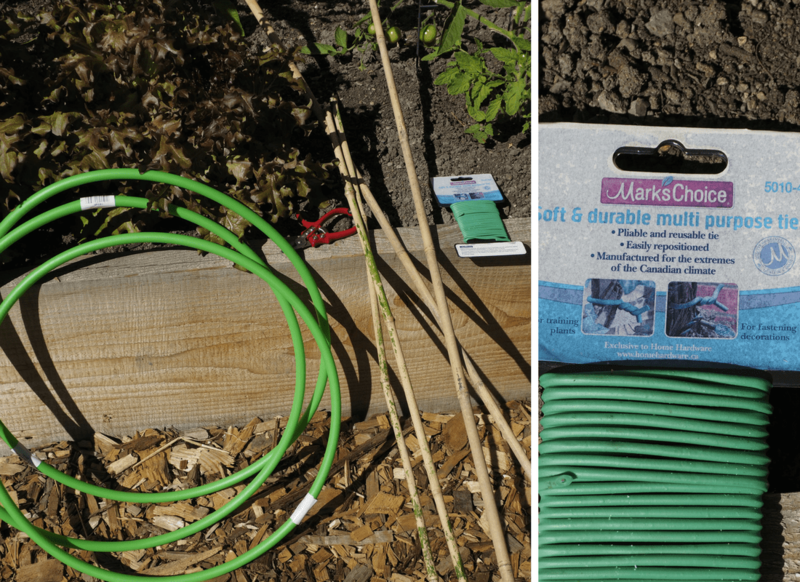 I found for some plants that I only needed three hoops and for others four. It really depended on the plant and how it was growing. 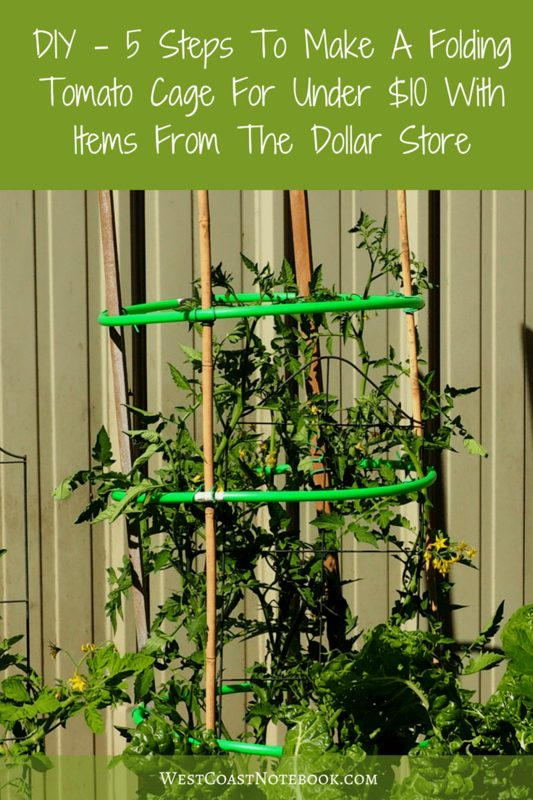 At the end of the year, you can store the tomato cage in a couple of ways. Pull them up from the ground, fold them and stack them up against a wall. I love the fact that there are no metal parts. 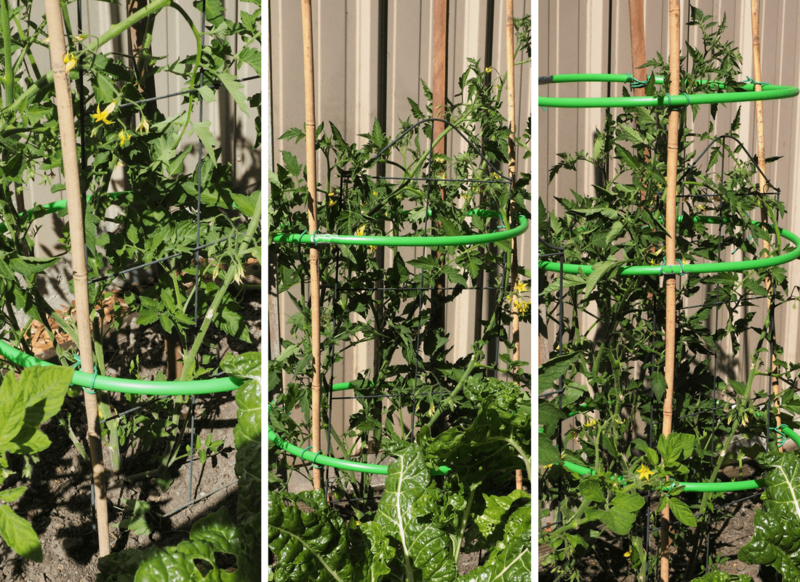 Over the years, I’ve used the traditional tomato cages which don’t take into account that tomatoes grow higher than they are. Then there is also the fact that they get mishappen over the year and are hard to store. 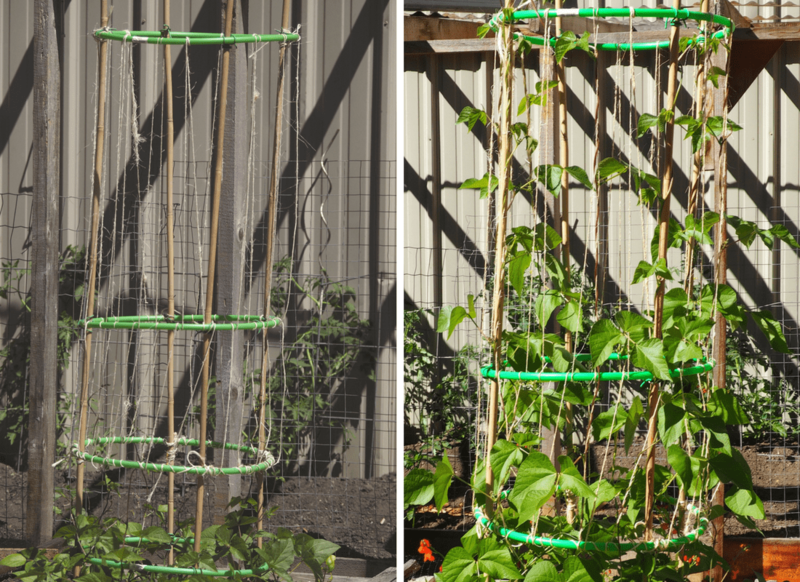 I always had in mind to build a tomato cage, but while I was waiting for the tomatoes to get some height, I thought the same premise would work for a bean trellis. Starting out with just an idea, I didn’t have all the pieces in place yet. My first initial thought was to somehow attach the hoops to the bamboo stick and I was overcomplicating things. On the other hand, as you can see from the picture below, this actually worked. I got the hooks at the Dollar Store and I’m just using rubber bands to hold it in place, so that is an option that can be used as well. When the beans were high enough, I tried to get them to wrap around the hoola hoops, but they kept falling off. It appeared that the plastic was too slippery a surface for the beans to hold onto. So taking some jute twine I wrapped it around the hoops to give the beans some purchase as in the picture above. 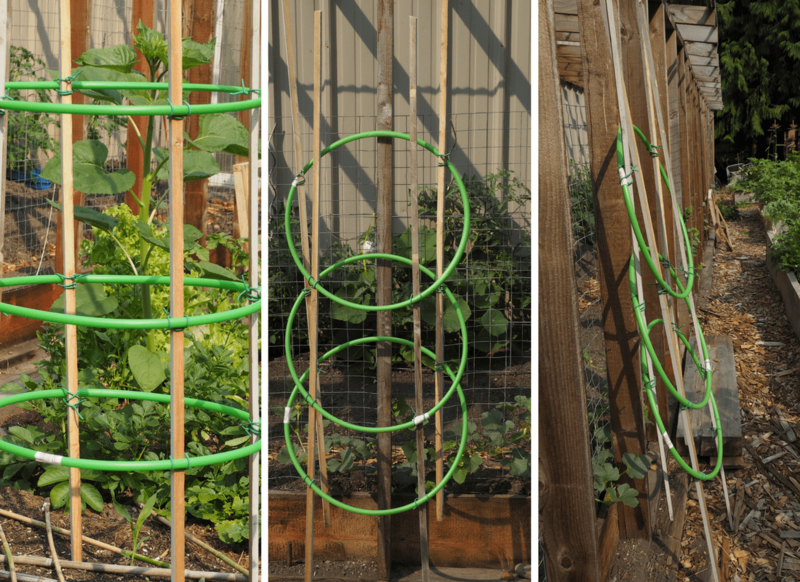 While I was doing that I realized that the beans would need support to get them to the next level so I just started at the second hoola hoop from the bottom and brought the string up to the top hoop wrapping it around the middle one on the way up. I just did a continuous line of strings down to the bottom and up again to the top approximately four to five times between each bamboo pole. Worked great and the beans started to grow up the twine. Doing the bean trellis again, I would just put the hoop at the bottom and the top, and put in more upright lines, but for my first attempt, I’m happy with it. It’s all a learning experience. I ended up doing a little modification on the sticks in case you noticed they don’t all look the same. Rob found me some 1 inch by 1/2 inch sticks and I just cut them to 6 feet and used them instead of the bamboo. This made the cages even less expensive as this was lumber we already had laying around. You might be able to use PVC pipe as you can get that in a 10-foot length and just cut in half to make 5-foot tall cages. Lots of options out there if you just look around your yard.